Allan Jenkins celebrated this first hat-trick of his 18-year professional football career at the weekend. 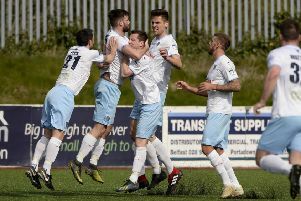 The Scotsman gave his reaction to Times Sport after he netted a treble in Ballymena United’s 4-2 win over Warrenpoint Town. Allan Jenkins fires past goalkeeper Jonathan Parr for the second his his three goals in Ballymena United's 4-2 weekend win over Warrenpoint Town. Picture: Press Eye. For more United news and views, don’t miss the Ballymena Times - in print and online.